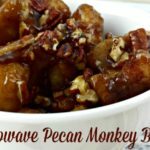 This Microwave Pecan Monkey Bread is simple and delicious and takes just minutes! The whole family will love this tasty breakfast treat! #ad – Thank you to #RhodesBread for the opportunity to develop this recipe using Rhodes Microwave Cinnamon Rolls! This Microwave Pecan Monkey Bread, takes less than ten minutes and is just the right size. Using delicious Rhodes Microwave Cinnamon Rolls, you’ll be ready to enjoy this delicious treat in no time! The cinnamon and brown sugar goodness is just so delicious. If you’re not a fan of pecans, you can swap them out for walnuts or just omit them. You could also add dried cranberries or raisins if you desire. I find that this is a very sweet dessert and doesn’t need the icing, but of course you can add it if you like. Some of the items below contain affiliate links; I am a participant in the Amazon Services LLC Associates Program, an affiliate advertising program designed to provide a means for us to earn fees by linking to Amazon.com and affiliated sites. However, I only promote things that I love and think you will love, too. For more information, please see our Disclosure Policy. For a list of some of my favorite items to use when cooking, please visit my Kitchen Resource page. 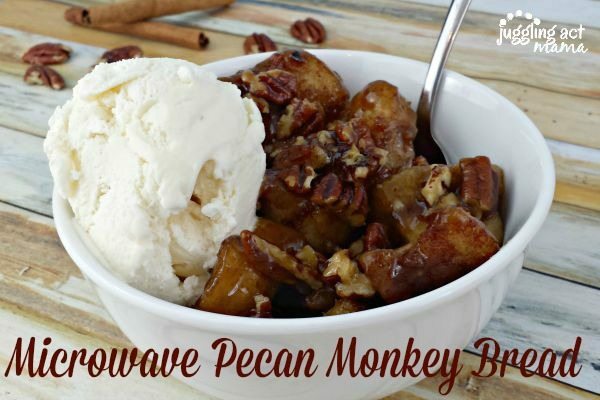 This Microwave Pecan Monkey Bread is the perfect quick breakfast treat. It also makes a great dessert - just add a scoop of vanilla ice cream or some homemade whipped cream! Allow the cinnamon rolls to thaw at room temperature until you can easily cut them into quarters. Alternatively, you can place (4) cinnamon rolls at a time on a paper plate. Microwave them on defrost for 25 seconds. In a liquid measuring cup with a spout, combine the butter, water, brown sugar and cinnamon. Microwave for about 1 minute until the butter is melted. Stir to combine. In a small microwave-safe glass baking pan or casserole dish, layer pieces of the dough and and drizzle on the brown sugar mixture. If you're adding dried fruit, sprinkle it in between the pieces of cinnamon roll dough. Microwave for 5 minutes at 70% power or until done. Top with chopped pecans and serve immediately. If you're not a fan of pecans, you can swap them out for walnuts or just omit them. I find that this is a very sweet dessert and doesn't need the icing, but of course you can add it if you like! 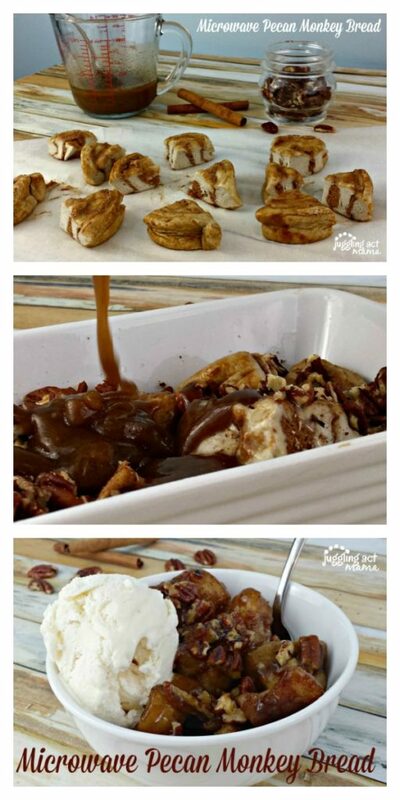 Microwave Monkey Bread with Pecans This Microwave Pecan Monkey Bread is the perfect quick breakfast treat. It also makes a great dessert - just add a scoop of vanilla ice cream or some homemade whipped cream! 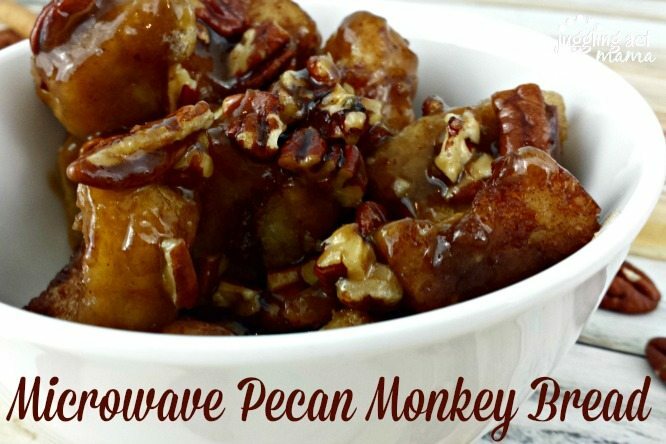 This Microwave Pecan Monkey Bread is the perfect quick breakfast treat. It also makes a great dessert – just add a scoop of vanilla ice cream or some homemade whipped cream! This looks incredibly delicious and easy to make! However, I am having trouble finding the recipe. I tried clicking on the line “Get the..Recipe Here..” above, but no hyperlink seems to be activated.